That strong north wind is carrying more than just cold weather. The end of deer season is right behind it. You still haven’t killed a buck. And you burned most of your vacation days during the rut. But you don’t need much more time off to kill a big, old late-season buck. Five days will suffice — and they don’t even have to be five consecutive days. This is still deer hunting, and there are no guarantees. But with time running out, this five-day plan is your best chance at killing a bruiser. It may seem counterproductive to limit your hunting time when you only have five days, but you can’t kill a deer if none are around. It’s far better to spend two or three of your five days nailing down the best spot for a couple good hunts, rather than four of those days sitting in a gar hole. The late season is driven by the belly of the beast, so your first scouting goal is to find food. 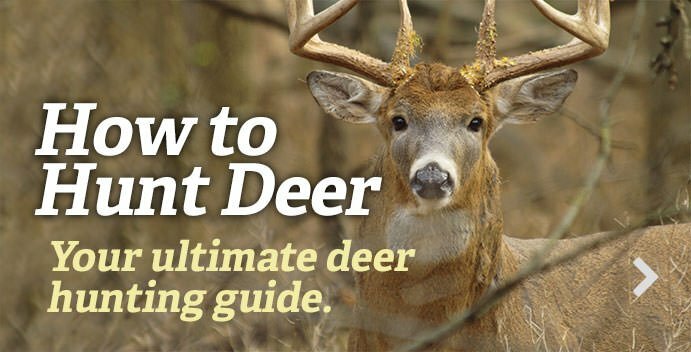 Expect deer to concentrate in big numbers around the best food sources right now, old bucks included, since they can lose up to 30 percent of their body weight during the rut. Don’t count on seeing late-rut activity, but if you do, it’ll be because a select few doe fawns have come into heat for the first time. Those fawns will be on the food same as the other deer, so that’s where the bucks will look for them. In the North and Midwest, late-season food means corn, soybeans, and milo as well as hard mast and brassica plots. Down South and in the East, you can still count on the row crops and hard mast, but also look for “green stuff” like wheat and oats, clover, and a variety of soft mast and browse. Much of that stuff stays palatable all winter long. Regardless of where you're hunting, grain fields such as corn and soybeans receive more attention when it’s bitter cold. Green fields such as wheat and brassicas tend to be more attractive when temperatures are rising. After you narrow down some food-source options, begin picking apart the terrain, starting with aerial images and topography maps. It’s just as important to know where deer are bedding as to know where they are feeding right now. The first two places of interest during the late season are south- and east-facing slopes. These locations are where deer receive shelter from prevailing wind and catch the first rays of the morning sun. In general, does bed closer to the food source. Bucks typically bed farther back in the cover and higher up on the slopes. After you’ve narrowed down likely spots — food and bed — head to the woods to confirm things. Start in the morning hours on foot by scouting food sources and trails for fresh tracks, droppings, and even buck sign. It’s not at all uncommon to find fresh rubs and scrapes weeks after the rut peak. When you find the sign you’re after, hang cameras right away, preferably by noon so they can capture any evening activity. Day two is your contingency day, and will be spent much like day one. Even if you find a food source covered in deer tracks, there may not be a shooter buck using it. But if you find three food sources, odds are a shooter is hitting at least one of them. Now that you know what to look for, keep looking for the very best opportunity. But don’t dally, either. Start dialing in on a specific hunt plan if you’ve found a killer area. If the food source allows for distant observation, spend an evening glassing from an observation stand or simply a good vantage point. If the weather conditions are favorable, your buck will probably step out just before dark. Take in every bit of detail you can about where he comes from and where he goes, and move in to kill him the next day. That’s in a perfect world, of course. Sometimes there isn’t a “smoking gun” food source, particularly if you’re hunting in the timber or if the area hunting pressure is especially high. In that case, forget the food and focus on overlooked sanctuaries. Consider sanctuary or refuge areas that have been untouched all season. Late-season bruisers seek refuge in brush piles, blow-downs, swamps, drainages, old farm machinery piles, and fencerows. They’re smart. They know where to avoid hunters. Check these areas for big, fresh tracks, and maybe a rub or two. Hang a camera and hope for the best. The Covert Blackhawk LTE is a solid option. If you spend an honest two days scouting in good whitetail country, you will probably be on at least one good buck. Hopefully you have photos of him or have even seen him yourself. If you haven’t, sign left behind can still tell you much of what you need to know. Regardless, today is the day to begin hunting, even if you’re still doing a bit of scouting, too. If you don’t have photo or visual confirmation of a buck yet, climb a tree wherever you’ve found the best, freshest sign and just see what happens. Leave your cameras out, and return to check them after dark. Remember — and this goes for deer hunting at any time — cameras can’t capture a fraction of the intel that you can from a stand. You’ve put in your scouting time to this point, so when you pick a spot, remember that it’s for a reason. I’ve noticed a pattern in my hunting career. Five of my top eight bucks were a product of hunting the same spot for three consecutive days. Sometimes it was in the same stand. Sometimes it was spent between two stands in close proximity due to wind changes. I’m not encouraging stand burnout, but this late in the game, you don’t have much to lose. A buck isn’t going to do the exact same thing every day, especially not in a pressured area. Therefore, it reduces odds significantly to “stand-hop.” If deer are there, hunting the same spot several consecutive days will put you in position when that buck finally slips up. Cold Fronts: A strong cold front is big-buck kryptonite. It will bring a temperature swing of 10 to 15 degrees in a 24-hour period. Warm Fronts: Here’s a funny twist you don’t typically read. Southern deer are a little different than their northern cousins. Extreme cold can make them hunker down instead of embarking on feeding frenzies. In the South, a warm-up on the backside of a serious cold streak can be productive. Rain: A chilly, dreary afternoon with a steady rain often gets deer on their feet early. Barometric Pressure: The best window is between 30.00 and 30.40. The deer will be on their feet with a barometric pressure in this range. Wind: Deer prefer low to moderate wind speeds. Moon Phase: I keep a journal in which I log moon phases, weather patterns and numerous other factors, and then I compare it to deer sightings. I don’t see as many deer on or near a full moon as I do between new and crescent moons. But, my entries have also shown that a day with good weather and a bad moon phase is still more productive than a day with bad weather and a good moon phase. Moon Overhead/Underfoot: This bucket holds a little more water. You know that Realtree Fish and Game Forecaster? That’s based on the moon overhead, moon underfoot concept. Look at it. According to it, deer activity peaks at two points during each 24-hour period. You’re hunting hard now, and time is running out. But don’t get sloppy. You can’t afford to bump many deer. Undetected entry and exit routes to your stand are critical. Make sure your walk to and from the stand is low-impact. This might mean walking right across an open field to access your stand, but sneaking out by way of a creek in the timber after it gets dark. Afternoons do tend to be more productive during the late season, but you shouldn’t discount the morning sit. My trail cameras have shown mornings aren’t as terrible as some hunters believe. Granted, deer are much easier to spook of a morning because they tend to be up and moving while you’re getting to your stand. But when you only have a few days, every minute of daylight is time you could be in a tree. If you’re hunting one of those sanctuary thickets mentioned earlier, morning sits can be especially productive. Sure, it’s your final day, but also your best one if you haven’t killed a buck already. By now, you’ve figured out some kind of a pattern. If you spent yesterday on the food source and the deer didn’t show up until dark, move 50 to 100 yards closer to the bedding area. Chances are those deer are staging in cover, just out of sight. It’s risky, but also the last day and your best play. We’ve already discussed morning vs. evening hunts, but don’t overlook midday, either. We think we pattern white-tailed bucks. Reality shows us it’s often the other way around. Some studies suggest that buck movement between 10 a.m. and 2 p.m. increases during the late season. If ever there was a time to “go for broke” and hunt all day, the final day is it. If you’re there at 2 p.m. and he doesn’t show, you haven’t lost anything. Editor's Note: This was originally published December 5, 2014.